The Beltway Plaza is a very strange, mid-sized mall located in the northeastern suburbs of Washington, DC, near (as its name so slyly suggests) the beltway. It has about 1,000,000 square feet of floor space and hosts around 110 stores, and was one of the more interesting malls that I discovered in Mid-Atlantic Adventure™ last week. The Beltway Plaza appears to be very old, though I’m not sure of the exact vintage. It was originally constructed as an outdoor shopping plaza in 1960, and I would guess it was enclosed sometime in the mid-1970s to early 1980s as a result of the decor and the extraordinarily high ceilings, which were done away with in malls later on because of their high heating/cooling and maintenance costs. The mall’s fabulously retro-modern cloverleaf logo could also be an indication of its age. The Beltway Plaza is particularly odd because the center’s eastern end features a clump of anchor stores: Target, Marshalls, Burlington Coat Factory, and Value City, and the latter two are the only ones with mall access. These anchors are all jumbled up into a big, three-level pile loaded at one end of the mall, despite that the mall itself is only one level. 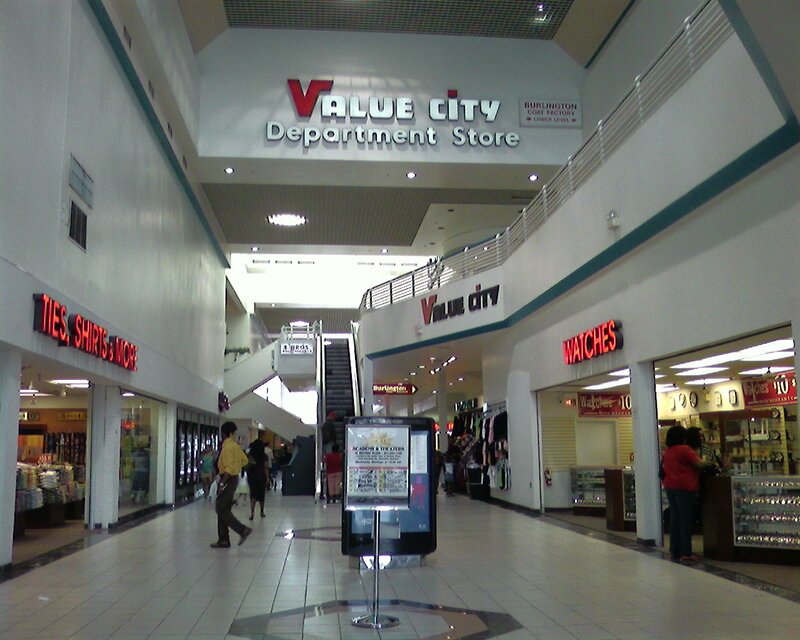 That creates an odd situation where Value City is actually located in a kind of “loft” above the mall, which you can see in the pictures below. I thought that was pretty neat. The other end of the long mall has a large “Y,” and features a Giant Supermarket with mall access, another true rarity. 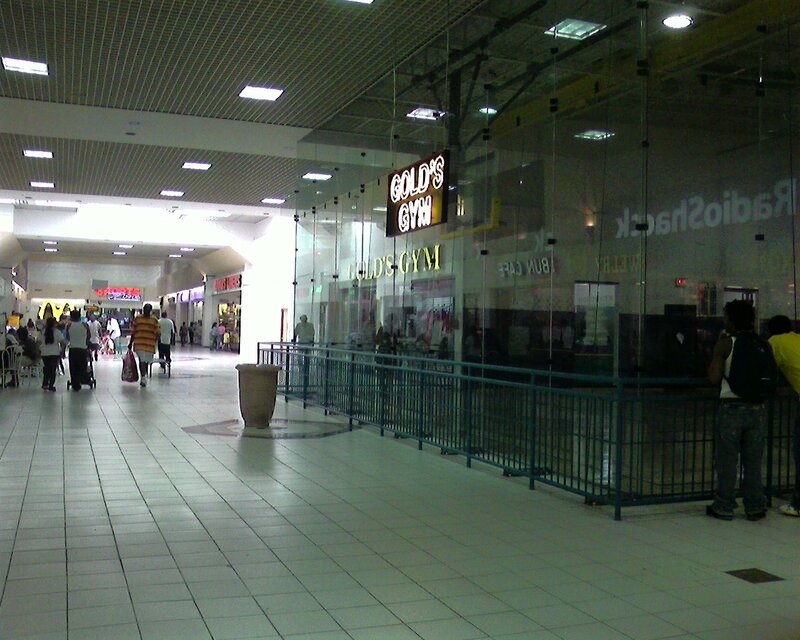 The Beltway Plaza also featured a Gold’s Gym in the center of the mall, with a large basketball court surrounded by glass walls protruding into the center of the mall corridor itself. Aspiring NBA stars looking for some attention could do much worse. Unfortunately, despite some of the truly unique attributes of the Beltway Plaza, it seems that it may be on the endangered list. Located in a somewhat prosperous part of Prince Georges County just outside of College Park, the center is in a prime location for top-tier retail, and there is a proposal to blast a roadway straight through the center of the mall from the mall’s main entrance opposite Cunningham Dr. straight through to Breezewood Drive, creating a “Main Street-type shopping environment.” This sounds like a shame, especially considering this discount-oriented yet relatively mid-tier mall seems to be doing quite well as it is. There does seem to be hope. The above appears to be only one proposal of many to improve the area around the Beltway Plaza Mall, and this document (which is a PDF!) details another, which would add some substantial aesthetic improvements to the area without de-malling, and in fact would expand onto the rear of the Beltway Plaza with a Main Street-style promenade instead. I wasn’t able to find much about the mall’s history (such as its original anchor tenants, as the above were clearly not original to the center), so if you have any familiarity with the Beltway Plaza’s history or its future, please leave a comment. I actually grew up near Beltway Plaza in Bowie Maryland, approx. 10 miles away. In the 60s and early 70s, there were very few retail options in Bowie proper, so residents traveled to Greenbelt along with Annapolis (Parol Plaza) and Hyattsville (Prince George’s Plaza) to shop. In the 70s Landover Mall opened in Landover. This hugh mall is now closed. From what I remember in the very early 70s, a large, 3 story Kline’s (sp?) department store was located at the eastern end of the plaza (where the cluster of anchor stores are located now). Kline’s closed in the late 70s/early 80s. A portion of the store was replaced with a Best and a Basco for a while. Much of the remaining space remained vacant. The plaza itself was enclosed in the late 70s. This poor mall has had so many remodels and additions over the years, it tough to see what it used to be. Here are a few of the items I remember. The upper potion of the former department store was actually turned in to an extension of the mall in the late 80s. Shoppers would access this area by taking escalators in front of the former department store entrance from the mall … this was a disaster from the get go since the mall could not even keep it’s current space rented. A large multiplex cinima was added in the late 80s replaceing a smaller theater at the western end of the mall. The Giant grocery store and “Y” addition as added in the early 90s. I beleive the parking deck out front was added at the same time. Thanks for your Blog. I enjoy reading about your adventures exploring older retail sites. Keep up the good work. I think there was a Montgomery Ward in this mall at one point. Never was. There was an S. Klein, but no Wards. There used to be a Caldor at the eastern end of the mall. I don’t know just when this mall was built, but I do have a lot of info that can clear up and expand on the existing comments. The whole multi-story anchor portion at the eastern end was originally the department store S. Klein. I am not sure if it was original to the mall, but whenever it was they built it, they had to dig away at the hillside next to that end of the mall to level the ground. To this day there is a huge retaining wall there. In the course of digging and putting up this wall, there was a collapse and one or more of the workers were buried alive. I have not been able to find anything online about this event, but it’s widely known by people who lived in that area who were around back in the 60’s. By the late 70’s S. Klein was just a memory, and Best took up much, but not all, of that space. I think the rest was vacant. In the mid 80’s, a small chain called “Bud’s Depp Discount Drugs” opened up in a section of the ground floor of that building. I think it was the brainchild of Bud Fantle, who once ran People’s Drug Stores and later Dart Drug. The Deep Discount store didn’t so so well, and by the late 80’s was replaced by something else I can’t recall. Best stayed around until that chain folded in 1997, I believe. The upstairs “mall extention” to the building I believe included only the western half, I don’t think it even used all of the second floor. Burlington Coat Factory opened some time around then, but I don’t believe they were on the second floor, as is indicated on the mall directory photo above. I think it was in the Marshall’s space, or perhaps part of where Target is. I recall going down stairs, so it was either on the ground floor with upstairs entry (which would be weird) or in semi-basement part of the old S. Klein. After the upstairs shops failed, that part became a Caldor, to much fanfare. That is about the time they built the garage in the front of the mall (making the whole place much uglier than it was.) Caldor was there only 3 or 4 years before they went out of business, then it became Value City. The Academy 8 Theaters in the back were an extension in the late 80’s, that used to be simply a large exit. In the “center court” south of the theaters/exit, there was one of those “conversation pit” seating areas so popular in 70’s malls. The original theaters, also AMC, were the Academy 6, in the space currently occupied by Gold’s Gym and perhaps units to the left of Gold’s. This theater was actually in operation until at least 2003, perhaps into 2004. It has been upgraded around 1999-2000, so I was surprised to see it go, since for those 4/5 years it was in better shape than the “newer” Academy 8 extension. I think location had a lot to do with it. This part of the mall used to be easier to get in and out of quickly. Before the late 90’s, the end of the main mall hallway was just past the Gold’s, and Jeepers was a hallway leading to an entrance just next to the current Hollywood Video. Just north of that, in the westernmost part of the main mall, was a large Golden Dome Arcade. An additional Golden Dome was built a few years later in the front parking lot (this one was actually shaped like a dome, but was smaller than the first.) This eventually became Funcoland/Gamespot, and was there until at least 2004. I am not sure if it’s still there now. 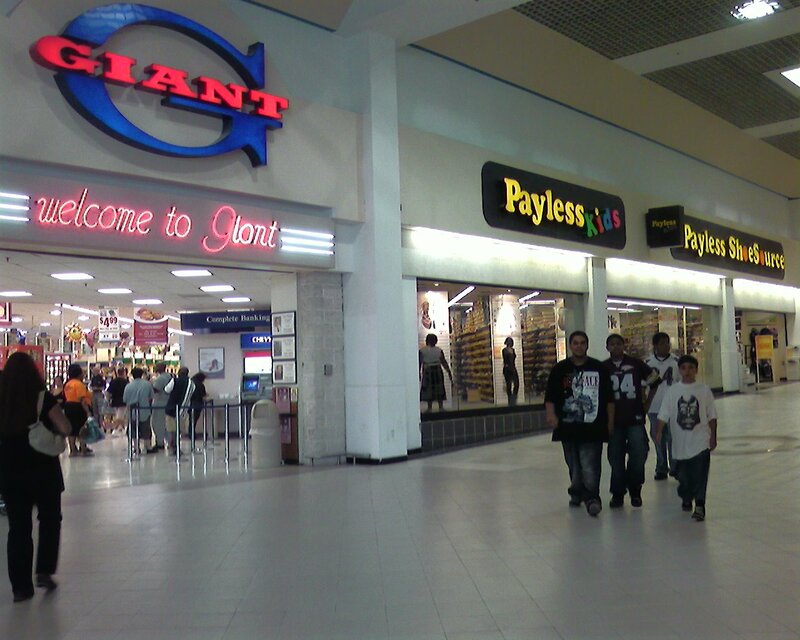 The Giant was built in the late 90’s to replace an old location accross the street from Best. That is when the hallway was extended into the annex area and new retail units were created along that hall. I think that’s also around when the old western front entrance was closed and Jeepers moved in. As for former major tenants, there was once a Chesapeake Bay Seafood House, possibly where the NY Buffet or Fashion Bug currently is. There was a second theater besides AMC 6, it was in the western “forward” section, around where Party City is now. I think that theater (which may have been “twinned” or “tripled” by the 70’s) was the original theater to the complex, as it was already run down and leaky by the early 80’s and closed around then. AMC 6 probably came some time in the 70’s, as it was pretty nice and modern in comparison. I am honestly surprised that this mall is alive and well while Landover Mall is nothing but rubble. In the early to mid 80’s, Landover was a major “modern” mall while Beltway Plaza seemed like a cobbled together collection of second-tier retailers and mom and pop businesses. The arrival of a Burlington Coat Factory, usually the “canary in the coalmine” for any shopping center, failed to signal a decline. This mall actually seems better than it was in the 70’s even though it is still largely composed of small businesses and unusual anchors. Even before Target and Giant arrived it was on the upswing. It never seemed “ghetto” even at it’s low points, which is more than can be said for Landover Mall or even PG Plaza before it’s renovation. Good to see an old mall adapt and thrive without having to become a “power center” or “main street” or other such retailing fad. (Though it may yet become “main streeted” if some of those proposals mentioned above go through. There was no mall. S. Klein which was built in the early 1960s was the entire south end of the mall. (All three levels) The mall cam later and connected to the building which was once S. Klein. I definitely remember S. Klein’s, which was located (as The Questioner said) at the end of the mall where Target, Burlington and Marshall’s are currently clustered. I also remember that the Chesapeake Bay Seafood House was just inside the entrance at the opposite end — near the movie theater and across from what is now Jeeper’s. I remember Montgomery Ward stores at the outdoor shopping centers at Capital Plaza and at Wheaton Plaza back in the early to mid-70’s, but I don’t remember there being one at Beltway Plaza…but don’t quote me. S. Klein “On the Square”…had a fairly decent record department there, as well as clothing…a general department store that wasn’t too pricey. I remember an article about plazas many years ago, and it described Beltway Plaza as one where a consumer could purchase “a vast array of Elvis on black velvet paintings.” Does anyone remember the restaurant that specialized in steak and offered lotsa beer and wine by the carafe? Sort of an English pub-style restaurant. @Paul in Silver Spring, that was beefsteak charlies..i miss the 60`s/70`s of our towns. duckpin while you can, there all dying. as “all the beer, all the rootbeer (soft drinks) and ice cream you could eat”. A nightmare – used to get the UofMD football team in there and stay for hours. You didn’t get a min. wage – you actually had to pay the house $2 per hr. while on the clock and get it recycled back 2wks later in the form of a paycheck! an O’Brien’s BBQ restaurant. The mall was always a bit on the ‘schlocky’ side, owned by a man of great girth – last name wasSidney J. Brown. Brings back memories of my youth! They even have an info page on Beltway Plaza on Wikipedia for further info. Cheers! OOPS! Error, it wasn’t O’Briens BBQ that came in after Emerson’s left the building it was Beefsteak Charlies, sorry! I recall watching the mall being built circa 1970-71. We used to ride our bikes to the site just to see what was going on and to go to the lunch counter at the drug store. Originally, there was a strip mall/plaza consisting of an A&P supermarket, Beltway Movie Theater (nice and large, not a little box like nowadays), a liquor store, a High’s store (IIRC) and a Drug Fair. Drug Fair sat where Giant is currently located. Next to the plaza there was nothing, just a large open dirt/gravel space. Across this space at the east end was S. Klien’s Department store. We used to shop there a lot during the 60s and 70s. The mall did not have movie theaters at first and the large “Y” at the west end (near Giant) wasn’t there. There was no 2-level parking either and the pad sites were not in place in the parking lot, so no diner or other resturants. It was actually a decent place to shop at, and since malls were new to the region, attracted a lot of people. It was a whole lot quicker and more convient that PG Plaza. My favorite store were Klein’s and Sumie’s. Chesapeake Bay Seafood House used to have people waiting in long lines to get in. Place had great food. Giant was across the street where Staples is currently located. Now, to me, it is just too congested. The front parking lot is a nightmare. @steve w., Adding my 2 cents. I grew up there as well, and worked at Drug Fair for about a year back in 1981-82, and it was located at the right end of the old stripmall. There is a Sears appliance store there now. Where the Giant is now was A&P. Also adding to the S.Klein story. I remember they had regular power failures and before it was Best Products, it was Basco (I worked there as well). Kurt, yep I got it backwards. A&P to the left, Drug Fair to the right. The Gamespot/EB is still there. The outparcel that Mattress Discounters was in before the moved into the new outlot with Kinkos has been torn down and is being made into a Chevy Chase Bank branch. Sports Authority, around back behind the Value City down that weird hallway, closed this year and is still empty. There also use to be a small Petsmart over by Giant, but that closed last year and is now Gallo clothing. The 6 screen was a really nice theatre. The 8 screen is ok, but they need an exterminator. There were mice on the floor when I was there back in the fall. Cheap though. Also Jepper’s in now called Planet Fun. Same palce, different name. I’ve been shopping at Beltway Plaza for the last ten years or so. The space now occupied by the Target was a Michaels that was torn down with the new Target built in its place. There are a great number of mom-and-pop dollar stores in the place which adds variety as well as a great deal of entertainment value! @pubdog, I also remember a Frank’s Nursery and Crafts on the far end where the Target is now next to that large retaining wall. Up above are where all the PG County yellow school buses are parked. I did a little research and came up with the following. On Jul 15, 1962, The Washington Post and Times Herald published a sketch of the 320,000 square foot department store of the S. Klein chain, to be constructed in the Beltway Plaza Regional Shopping Center in Greenbelt. At the time the two story and basement structure would be the largest Washington suburban department store and was expected to open the following Easter. Interestingly, Gov. Millard J. Tawes witnesses the signing of the 30 year lease (the store would last only 13) between the plaza developer and S. Klein. I recall a Franks Nursery and Garden center being on the Target side before Target. At the time i think that store invested in upgrades to the landscaping in the parking areas. Another ‘anchor’ store worth noting, if a small one, is the original 3-Brothers restaurant. This mall also has a Washington Consumers Checkbook ‘best value and best price’ watch repair store. @pubdog: So THAT’s what used to be at the Little River Turnpike shopping center! I moved not too far from there a few years ago and have always wondered why there is a three-level building in the middle of a suburban strip mall (now known as the Plaza at Landmark). That former S. Klein space currently houses not only a Marshalls but a Shoppers Food Warehouse on the main level and a furniture store and a Bally’s Fitness in the basement. The second floor had a Tower Records until that chain’s demise at the end of ’06, as well as the original location of Bally’s until it moved downstairs last year. Both of those spaces are currently vacant. As a student at the University of Maryland and a nearby resident , I would like to add some comments on Beltway Plaza and the Mall. As others have indicated, as late as the mid 1960s – early 1970’s, there was a separate shopping strip with drug store, barbershop and a single screen movie theater. Across the parking lot stood the S. Kline department store. By 1972-73, a small indoor mall was created, situated between the strip shopping center and the S. Klein store. Along with a 6 screen theater, there was a steakhouse, a branch of George’s appliance store chain, an ice cream shop and in-house catalog store. The single screen theater in the strip center eventually closed. Several stores within the mall also closed. I recall flea markets setting up in the center of the mall and creating most of the mall’s foot traffic. With in a few years , as reported, the mall underwent major rennovations and the inclusion of an additional 8 screen cinema, a Giant supermarket was added to one wing of the former shopping strip, along with an enclosed area from the original mall to the supermarket. Large box stores Marshalls, then Target (replacing Frank’s Nursery) were also built ajoining the mall. While there is a branch of Atlanta Bakery nearby, I think the mall lacks a place for a good cup of coffee, like a Starbuck’s or Dunkin’ Doughnuts. I for one would love the idea of a town center approach in the future on the existing mall site. College Park was my hometown from 1964 to 1988… and I still live here in Maryland. Anyway, I read the blog posts to date, and have to agree with the postings of David Miller, Pubdog, and Steve W, regarding historical accuracy of the site and it’s development. As for my experience, I can say my family frequently visited the old strip’s, Movie Theatre, A&P grocery store, Drug Fair, pizza parlor, etc… We also shopped at the completely separate S. Kleins Dept. store… I also remember went it went out of business in the mid 70’s. I also remember the new “Beltway Plaza (Enclosed) Mall” being built… It was originally built in between the Strip Shopping Center and the S. Keins but still did not attached to either of the earlier buildings… There used to be a “Hot Shoppes Restaurant with Mighty Mo Drive Up Service” (presently the Silver Diner location)… As for the date of when the connections were made from the Strip Shopping to the “Mall” to the “Old S. Keins”, I can’t say for sure… On the other hand, I remember the opening of “Three Brother Pizza” in 1976 and at that time the “Mall was connected to “Best Dept” (the old S. Klein Bldg), however, the “Mall was still not connected directly to the “Original Strip Shopping Center.” Well, in conclusion I can say for sure, that I spent many hours and dollars in all of these retail places having a good time. I also agree with Michael Gregory, as I don’t want to see it torn down, however,a main street type modernization might an option to be looked at. I remember this shopping center well from growing up in Berwyn Heights (lived there from 1968 – 1994). A group of us kids would often ride bikes across Greenbelt Road to hang out at the mall, later I had my first job at the Showcase Theater which was located on the outside original wing of the mall. It was a old theater with one screen, eventually converted into two which meant projectionists would have to crawl outside on the back of the building along a narrow catwalk to get into the projection booth of the second theater. Eventually they closed the theater for construction of the Giant. The old Hot Shoppes became a Bob’s Big Boy (now Silver Diner). Chesapeake Bay Seafood House was great, but they seemed to have a knack for locating in troubled shopping centers. I think it became Beefsteak Charlie’s after they closed. Three Brothers was a big draw, this was before they franchised…it was the original pizza place with few tables and great food. It’s sad to go back and see the condition of the mall. My wife and I stopped into the new Target on a Friday night and witnessed a gang fight and lots of police presence, made me glad I moved out years before. The mall was doomed from the beginning, for one thing the original structure and the “new” enclosed mall never connected. Despite the good memories, a main street type retail setup would be the best thing to happen to the mall. 1. I don’t think you can discount the area surrounding Beltway Plaza when predicting its future. There’s a large apartment complex across Breezewood Road that has a really poor reputation (not unfounded… I used to live there! ), and I wonder how much that will influence any decision to expand to the back. 2. That said, I would have appreciated more of a welcoming back entrance when I lived there! 4. Overall, despite its sketchiness, there were some redeeming qualities of the mall. There was a men’s store where I could get some nice and decently-priced button-down shirts, and the workers were very helpful in terms of helping me find sizes I need (since I was shopping for teenage boys). There is (was? I left in 2005) a little hardware store in there–no need to go to Wal-mart to get keys duplicated. Plus, it’s a decent enough Target. And the Gold’s Gym is nice enough, as is the Marshall’s (when it’s not picked-over during the holiday season). Overall, functional enough for the basics and as a community shopping center, but depressing when you consider what might have been. I was employed by the Owner of Beltway Plaza from 1974-1976.
farther out. There was a movie theater in the lower strip. the brothers ran a restaurant. I think their Father had just passed away. restaurant was the big thing before Chesapeake Seafood House. There were a lot of jewelry kiosk and stores at the Plaza. numerous housing in D.C.He owned a large office building in Michigan. He had bought the Tower Building in Baltimore when I worked there. I use to live a few miles away in the Lakeside North Apartment Complex. I’m 30 now and I remember my Mom dropping my friend and I off every once in a while to go to the movies there. My dad also use to take me to the golden done which is now a gamestop. How time flies! I still remember watching many of the 80’s movies at beltway plaza! I moved from Greenbelt in 2002 and i have to say in the late 90’s, Beltway Plaza really changed. The crowd is not what it use to be. I hate to say this, but it is straight GHETTO now. The Springhill lake apartments right behind the mall isnt the safest apartment complex and those same people have poured into the mall. The only thing keeping that mall open is the movie theatre and the Giant and Target. I have many great memories of that mall while growing up. It was a great hang out spot when i was young. It isnt a place I want to be seen at now. @Mike, I worked at the Giant across the street, which is now another store…and back in the 1970s Springhill Lake was THE apartment complex to move into. They had a waiting list. It was immaculately groomed and there were enough children there that PGCPS had to build an elementary school in the community! Yep…it’s ghetto now…very sad. It’s bizarre when I drive through that area. Wow – forgot about the Hot Shoppes/Bob’s Big Boy; used to go to them on occasion. Some of you mentioned 3 Brothers. I can recall them opening and thought the pizza was pretty good. The shop was not as big as it is now. My younger brother worked there in the early/mid 80 when he was in school. One thing on the posting by pubdog. My dad was a volunteer fireman in the 50s to mid 60s and responded to the mud slide that killed the workers. He says it was a mess and they just could not dig fats enough to get to everyone. Sad time. Reading these postings has brought back memories of the Drug Fair, A&P (mom’s favorite grocery store for most of the 60s), the appliance store in the mall, dates to the theaters, Waxie Maxies, and my mom being employed by Sidney Brown in a building across Cherrywood from the mall. It also reminds me how much the area has changed. A lot of my friends had their first place in Springhill Lake apartments and although they were nothing fancy, they were not bad at all and there was very little to no crime. A far cry from today. Today, my mom will not shop there at night (they still live about 1.5 miles away) Sometimes I do miss large department stores such as S. Klein’s and Landsburg (in Langley Park/Takoma Park area). We shopped at S. Klein’s a lot. 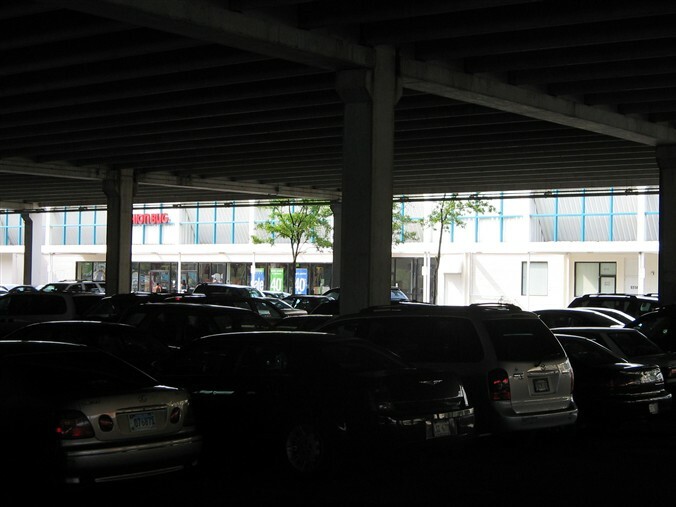 Having grown up in ‘old’ Greenbelt in the ’60s and ’70s, it was a big deal to go to this mall because it was on the other side of the beltway…”too dangerous” to walk or ride our bikes, our mothers would say. Yes, the S. Klein was the original department store up from the disconnected strip mall with the Drug Fair drug store, A & P, and laundromat, plus a couple of other stores. The strip sectioin was also closer to the road so when the middle enclosed section was built, the front wall lined up with the back wall of the original strip mall section. This meant that the strip section was connected, but was still outside. As kids we would still go there (disobeying our mothers). I remember playing ‘tag’ in the elevators of the department store, moving from floor to floor trying and catch each other. We were, of course, quickly kicked out when management noticed. When S. Klein’s closed, it was empty for a while. Others moved in and out since them, as has been mentioned. At the time, though, we all heard that one of the big problems keeping a new tennant from coming in was basement flooding. When Best Co. did move in, we noticed that the basement section of S. Klein was not included as retail space. It might have been storage or just left empty, I’m not sure, but it was not accessible to the public. The original theaters were a big attraction. Old Greenbelt had a single theatre that was built in the ’30s, but was declining. I remember seeing Star Wars at those new theatres, plus many more over the years. There was also a hair stylist location call Mantrap where most guys got their first non-barber shop haircut in the early-mid ’70s. A stylist cutting a guy’s hair was a very new thing at that time and only a few guys would go at first. Eventually, everyone was going there or somewhere similar. Later, there was a small Ritz Camera store near the department store end that only had an exterior entrance. I remember buying a great deal of supplies there. For a time there was also a lingerie shop that always seemed dark and mysterious, a jewelry store, a student tutor/learning center of some kind, various shoe stores, a game room, etc. This blog has covered most of the other shops and stores that have appeared there over the years…Chesapeake Bay Seafood House (yes, long lines), 3 Brothers, etc. I haven’t lived in the area for a very long time, but I understand it’s completely different now. You nailed Mantrap. Yep, had my first non-barber experience there, circe 1974. Of course, I had not had any haircut for about 3 years. The hair wash caught me off guard. It was Waxie Maxies across from it IIRC. store that had a smarmy guy working there who was chubby w/ a beard. He was very creepy and always came in the Emersons restaurant to oogle the girls working there in the short uniforms. UGH. @NixManes, Mantrap…you are exactly right…the first place I had my hair styled as opposed to buzzed. I grew up in Greenbelt in the 1960s, my Mother still lives in Boxwood. Fond memories – great to see here of Beltway Plaza. As others have said, started out as strip center – A&P, Drug Fair, Pizza Inn, Beltway Plaza Theater where I worked as an usher in the mid 70s while in high school. S.Klein separate anchor with stand-alone snack bar next door. Klein’s was great – you could buy a rowboat or a mink coat there — had eveything. Many a Matchbox car (great display case) & Tonka bought there. My Mother bought a mink stole there which she still has. At that time and years after, the Klein’s retail space was the largest on the east coast under one roof. The Hot Shoppes opened in about 1964-65 – had fun ‘curb’ service and pantry where you could buy Hot Shoppes products for home. Many a meal at Hot Shoppes – we need them back today. Decent strores now, but with Spring Hill Lake behind it, has issues. Mom not allowed to go there now…big plans for SHL, so maybe things will improve? I worked there for three and a half years at the Family Fish House in the late 70’s. It was there before Chesapeake Seafood house. Lines out the door every day for all you can eat. Everyone else has pretty much covered most of the memories. Let’s see, also they had a Radio Shack, Donuts Galore store, Suburban Trust Bank out in the lot, seems like some other stores besides Hot Shoppes were out in the parking lot too. My Mom worked for the owner or manager there for about three weeks before quitting and calling him an a*hole! And my Mom was the nicest sweetest woman you’d ever want to meet! 50th bday gift (a ring) on ‘layaway’ there, 1980. I remember waiting around all afternoon to see “Empire Strikes Back” when it first came out. I lived in East Riverdale but my family used to go to Beltway fairly often because Capital Plaza was in decline. In fact, I remember my elementary school principal using the local malls as an economics lesson when he had to stand-in as a sub one day, how everyone would go to the newest mall (then Landover) and the older ones would decay. Does anyone remember the Hobby shop including coins and stamps owned by Jerry Seigel? His first location was near the Aquarium/fish store, across from the original movie, and later in the center of the mall just a little further up? @JULIE, I remember the hobbie shop, julie. Bought ALOTTA estrs model rockets there! And I have yet to see one mention of the imfimous venemans music in any of these blogs! Ahhhhh, all the babes at mantrap! and grogs at emersons steak house. JESUS! What a mis spent youth!!! I also grew up near Beltway Plaza Mall. I think everything has been pretty well covered with the exception of a Texas Roadhouse style restaurant that was in the Big Boy spot before the building was torn down and Silver Diner built. Jerry Siegel moved his hobby shop to out to a shopping center in Jessup, MD near the prison. It was just east of US1. He was there for a few years at least. @Jim, Jerry had his hobby shop, called Continental Hobbycrafts, for around 15 years at Beltway Plaza starting in1972. He expanded from his original store and had quite a nice inventory. Can anyone tell how I could find more information about the Emersons Restaurant? I’d really appreciate it. I used to go to Emersons’s (steak and beer) on Old Georgetown Rd in Bethesda. A great family place in the mid 70s. The chain went bankrupt in the late 70s/early 80s. I recall some sort of scandal about beer. When I worked there they did not pay the waitstaff. You had to pay in to the “house” at $2 per hr. that was recycled less taxes as you so called paycheck. I also had to tip the busboys, bartender – suprised I went home w/ any money. @Lynda, John Radnay was my neighbor back then. He embezzled quite a lot of money from the company and used it for his home, to build his pool,etc. He went to prison. He’s now living in Florida where he owns a restaurant group. I worked at the original Beltway Theater as an usherette with my friend, Carol Baker. We wore cute little red tuxedo type jackets, and carried flashlights. The theater was managed by A Mr. Edward Camp, his wife Fayetta. There was a beauty shopjust down from the theater, run by Brits. Michael, Alan, and ? I do recall that there was a neat old house where the Kleins building was built eventually. I remember not wanting the mall to obliterate the house and then ended up working at S Kleins. The accident was very upsetting. I think Zayres was there, too, after Kleins went out of business ? After getting laid off at Kleins, I headed to the theater with a lot of eyeliner, and teased hair. I remember a small food place next to the theater. When I visited the mall a few years ago, I didn’t like it at all. It was cold, and uninteresting. My junior high school sat up on a hill beside the mall, and is still there, I guess. It seems like only yesterday. I have tons of Maryland memories. I am 62. @Peggy Coleman, I believe the food place was called Pizza Inn. I remember going there with my Mom and older Sister on Saturdays. I cut hair at Mantrap from 1974-1976 and the mall was closed in. @Kellie Maykrantz(Katz) Bergen, Mantrap was cool. Great music and a real laid back mood. You don’t find places like that anymore. Anyone remember Electric Head over in Hollywood? @Kurt, i have been searching for the artwork/on the side of the house the (electric head dude) any idea where i can get a picture of this?i posted a pic of the house as it is now in our fbook group lanham seabrook. Did you ever locate a pic of the Electric Head Shop? I have been searching for this for years. @Kurt, oh, yes. I remember Electric Head. Neon yellow head shop. @Hollis Burl, I remember Electric Head too. I lived in the neighborhood behind it in the early 70’s. Also, in my memory there was a bike shop right near Electric Head where I got my first bike – Schwinn Stingray – circa 1974 or 75. Darn Kellie I just may have been one of your customers! Mantrap was my first experience with a non-traditional barber. When I walked in I had not had a haircut in 2+ years. This would have been late summer/early fall in 1974. This is a FASCINATING website/blog. I was doing a little bit of research because i’m considering purchasing property in greenbelt. i’m continuously surprised at how few people realize the value of greenbelt, location-wise. there are SO many arteries that run through and around this town. 295/495/rt1/201/193… that’s what i really like about it. re: springhill lake… the complex is now called “empirian village” (insert eyeroll here). the apt management is trying to beautify the complex, with mixed success. i think, in their hurry to look good externally, they are doing rather shoddy work. residents of the complex will attest to that. all in all, the mall itself has long fascinated me, for many of the reasons already stated. it has the makings of a decent mall but it just seems so… forgotten? blase? like a throw-away mall. not sure how to describe it. i think the atrocious double-decker parking needs to GO, at a minimum. there is plennnnty of parking at the mall (including the now-neglected parking space behind the mall, which actually has tall grass/weeds growing there, yuck). i’d like to see a town center in greenbelt. i think the property values would sky-rocket, and it would actually be a nice juxtaposition against beloved, historic greenbelt. i love historic greenbelt and am happy that it hasn’t changed. so, whether town-center style or otherwise, the mall absolutely NEEDS an upgrade. it is a major eyesore. as for empirian village… *sigh*… who knows? it might actually become decent. @jonesy, Old Greenbelt is amazing. Iived there for a year…and have a good friend who lives there now. It’s a fascinating time warp! I grew up in Adelphi about 10 mins away from Beltway Plaza. During the 80’s I only went to this mall to hang out with my friends either at the Golden Dome Arcade or going to the AMC movie Theatre. Most of the big movies of the time I saw at this mall. I don’t live in the area anymore, I just go back to visit once or twice a year. Unfourtunately if the big department stores leave Beltway it will have the same fate as Landover Mall. I grew up right on the Adelphi/Beltsville line, so my family and I were frequent visitors to Beltway Plaza. I remember seeing “E.T.” and “Short Circuit” at the movie theater there (and crying at the end of both), and my family loved going to Best when it was there-we made a lot of our electronic purchases there, and I remember saving my allowance for months to be able to get a GameBoy! Frank’s Nursery and Crafts was a favorite “haunt” of mine for beads, ornament kits, and plenty of other goodies, and I remember seeing the Golden Dome Arcade in the middle of the parking lot (which my mom, being dead set against video games for some reason, wouldn’t let me go into). I also remember when Caldor opened up on the upper loft (unfortunately, it didn’t stay long). I don’t live in “P.G.” anymore either-I left for college in 1992, and in 1995 I officially left for good (started renting a place off-campus). My parents left the area after my dad retired, so between that, my friends moving away, and all the development taking away my old “haunts,” there’s really no reason for me to go back there again. The last time I went down and checked out my old stomping grounds, things had change to the point where I felt severely dislocated and couldn’t wait to get the heck out of Dodge! Still, as long as we have our memories, that’s a terrific thing. I have shopped here for about 20 years & always had a decent time there. I remember Golden Dome (both locations( back during the Street Fighter/Mortal Kombat craze & that place was always jumping on the weekends. I also remember Best, the original Waxie Maxie’s, TJ’s Roadhouse before it got torched & Video Village. Unfortunately that “Main Street” proposal may actually go through because FYE is closing sometime in January & Kay Jeweler’s is doing the same thing. The arcade (now known as Fun Center) is pretty much dead. They haven’t gotten any new machines in 5 years. The top level is a ghost town. As for the slope, the retaining wall & concrete parking is really starting to show signs of inevitable collapse. I have family that grew up in BH & remember when the entire BPM area was all woods. I also heard a story where one of the buses from the PG county bus lot supposedly fell down the slope, is this true anyone? I hate to see that slope collapse & see 27 buses land on the Target location all mangled. Yes the mall has become somewhat of a joke. The renovated theatre, Giant, Target & GameStop pretty much keep this place afloat. Bennigan’s became William’s Bistro. 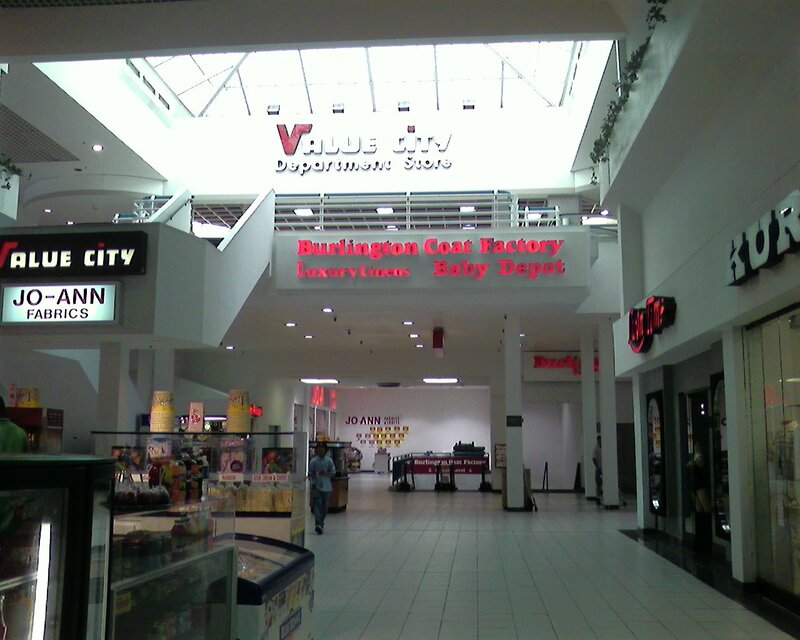 Will BPM become a “dead mall” in the near future?? Let’s hope not. I worked at the bavarian pretzel shop with my best friend. My mom worked at G.N.C. and my boyfriend worked at Waxie Maxies. Sometimes the guys from Mantrap would play with remote control cars in the mall in front of their store. 1976-1977. Wow what a TON of amazing images and names and memories! I grew up in the area and still live here. I did NOT really shop Beltway Plaza as a kid or young adult mostly because Iverson Mall and Marlow Heights and Landover Mall were easier to get to. But I DO recall shopping at the S Klein store a lot. Once I got married and moved nearer, I’ve enjoyed shopping the (admittedly very different) current incarnation of Beltway Plaza. Value City has been replaced by a Shopper’s World now, but I really like, I have to admit, the number of smaller merchants surviving in this mall. I prefer to see my dollars get into the local economy when I can. I almost NEVER go into the Target. I got accustomed to the easy parking and access from the elevated lot behind the Sports Authority (now defunct) and the Value City — why no one ever seemed to park there I couldn’t imagine! — and so the stores that don’t connect with the mall hallway were too remote. In high school, my music groups sang at Christmas time at the Iverson Mall and it was, indeed, a very festive, special venue. Terrific blog, thank you for all the photos and accounts of different regions’ changes! Emersons was a great steakhouse at Beltway Plaza. They served beer and root beer in half sized plastic pitchers. As kids we always tried to see how many pitchers we could drink. They had a nice salad bar located in the middle of the restaurant. It had typical sald items, but also had loaves of french bread you could slice pieces off. And of course my favorite part, a bowl of steamed shrimp in a large plastic salad bowl. The shrimp were mixed in with crushed ice. Well it was more like chips of ice. It was miderable trying to get those small shrimp separated from the ice. I would say the shrimp size was 41-50’s. The place was really dark inside and had booths setup on the perimeter. Each booth had curtains drawn back to create an intimate experience. The side shopping center on the western end of the facility, there was a pizza place called Pizza Oven. I remember reading their menu all the time and seeing locations all over the US. Probably 40 or 50 locations which was pretty good back in the late 60’s. As others have said, in the parking lot where the diner is, it used to me a Hot Shoppe. And then a Bob’s Big Boy after that. Both owned by Marriott of course. Hot Shoppe had great orange freezes. Great memories. My 89-year old mother recently passed away and I would have enjoyed printing out these comments and recollections and sharing them with her. I, too, grew up in College Park and trips to S. Klein were a big treat. My brother got Matchbox cars and I got Barbies! I also remember getting the first Beatles albums there. I saw Gone with the Wind in 1969 at the original theatre next to the A&P. I continued going to that theater when it was converted to a twin screen in high school. There was video store (all the rage) right at the entrance to the mall next to the original shopping center (I don’t think we called them strip malls then!) called Video Village. The aquarium store was there, too. Outside as was mentioned, the Big Boy restaurant was a favorite late night stop for those of us from Parkdale. They had a salad bar that was all the rage in the late 70s! On the other end by Three Brothers, there was a Roy Rogers restaurant. Lots of memories. Oh – and further down where the Thai restaurant is . . . that was a Pappy’s Pizza Parlor!! I don’t think anything was between Cherrywood Lane and Pappy’s – maybe a gas station. I first visited Beltway Plaza when I was an undergrad at the University of Maryland in College Park. After I graduated I got married and permanently relocated to Greenbelt. I’ve seen Beltway Plaza undergo numerous changes over the years and I’ve enjoyed reading all of the recollections. S. Klein was gone by the time I started going to the mall but I do remember Best. I purchased so many wedding and baby shower presents for friends there that were well-received and it didn’t put much dent in my wallet. I still have memories of the time when the Cabbage Patch dolls were The Hot Toy and there was a long line protruding from Best out into the mall itself because the store got a shipment of the dolls. I was sad when that store went out of business. I also remember Beefsteak Charlie’s, Caldor’s, The Golden Dome (I spent many quarters on the video games there), and Waxie Maxie’s. The only thing that the previous posts left out was that I used to enjoy shopping at 5th Avenue Gifts, which was located where a Rave clothing store is located now. 5th Avenue sold Hallmark cards and fine collectables. I purchased cards and a few presents for friends and family members there. I was sad when it went out of business and there are times when I still miss it. My boyfriend (who later became my husband) used to love eating at Beefsteak Charlie’s, especially its unlimited shrimp and salad bar. After that restaurant closed, it was replaced by Mushashi’s, which was a Japanese steakhouse that included chefs cooking over giant metal grills while people were seater around the grills. My husband and I really loved dining there because the chefs were frequently entertaining. We were really disappointed when Mushashi’s closed after a few years because that place was usually crowded when we went. I don’t really like shopping at Beltway Plaza as much these days as I used to. Most of the stores there tend to sell ugly ghetto-style hip hop clothing and jewelry and I’m really not into that. If it weren’t for Jo-Ann’s Fabrics & Crafts, Three Brothers (whose pizzas are good as usual), and Target, I would never venture into Beltway Plaza. That mysterious lingerie shop that was mentioned briefly? It’s called – and I’m not kidding – Luv’n Time. It’s located on the corner across the way from 3 Brothers. In all these years, I don’t know that I’ve ever seen anyone shopping in there but yet it remains. Most of the stores have been covered EXCEPT a head shop that was there in the 70’s. I’m fuzzy as to its name or exact spot, mid-mall-ish is all I can recall. Some Cheech and Chong type dudes worked there and they had cases of pipes, etc. Around the same time there was another peculiar store that sold weaponry, like numchucks. The men’s clothing store was a Websters, I believe. I worked there for a VERY short period in the late ’70’s. They hired everyone who walked in the door and then laid most of us off just as summarily. But not my fellow employees who were letting their pals walk out wearing brand new leather coats right off the rack or carrying bags of unpaid-for merchandise. The cash registers were strangely located, right at the store’s entrance, away from boss’s eyes with a quick exit into the mall, which facilitated the thefts. In 1977 I got my first “Farrah” haircut at the barbershop/salon by Drugfair and the old theater. Saw E.T. at that theater – and was sorry when it closed in favor of those dinky AMC multiplexes. The last movie I saw in Beltway Plaza was Dead Man Walking. My fellow movie-goers were loud and obnoxious – there were even young children in the theater – and ruined the movie. When I spoke to the boy-manager afterward, he actually told me he was AFRAID to say anything to unruly patrons. Sadly, a young man was murdered for his coat at these very theaters in what I remember as the late 90’s. “Security” guards at Beltway Plaza have often looked every bit as shifty as the people they’re supposed to be watching. In the ’80’s, right up till its end, the A & P still had old-fashioned cash registers with those big clackety buttons and they didn’t having moving belts. I liked that “retro” thing they inadvertently had going. The old Klein’s end now has a Big Lots adjacent to Shopper’s World on the upper floor. These two stores are oddly similar to be housed immediately next to one another, although Shopper’s has more clothes and Big Lots more housewares. Both have the look of stores that could pack up and be gone in a night (which seems to be the trend). There’s a Popeye’s out in the front parking lot that does a good business. Springhill Lake turned Empirian Village is now Franklin Square. The management has made some improvements (if catching up a back-log of hundreds of maintenance requests can be categorized as improvement) and moved out some of their criminal tenants. It is still watch, wait and see if they can turn things around AND keep it up. I DO still shop at Beltway Plaza for its convenience but have a get-in-and-get-out policy, that is, shop in the morning and be on my way. Robbery is not unusual, particularly at the ATMS, the bus stops and the areas behind the mall leading to “Springhill/Emperian/Square”. The occasional car jacking or shooting in the vicinity – Greenbelt Metro nearby is a magnet for trouble – hits the news too. The mood in the place really changes in the afternoon – and I have NO desire to take in the night- time atmosphere. @”Kelly”, I remember “luvin’ time!” and Bud’s Deep Discount Drugs!!! I’m a new comer to Maryland having lived in Arizona for 34 years. I found out about the Beltway Plaza because I was looking for a Big Lots and my mother in law said there was one there. The mall is still standing and deffintely has a retro feel to it. 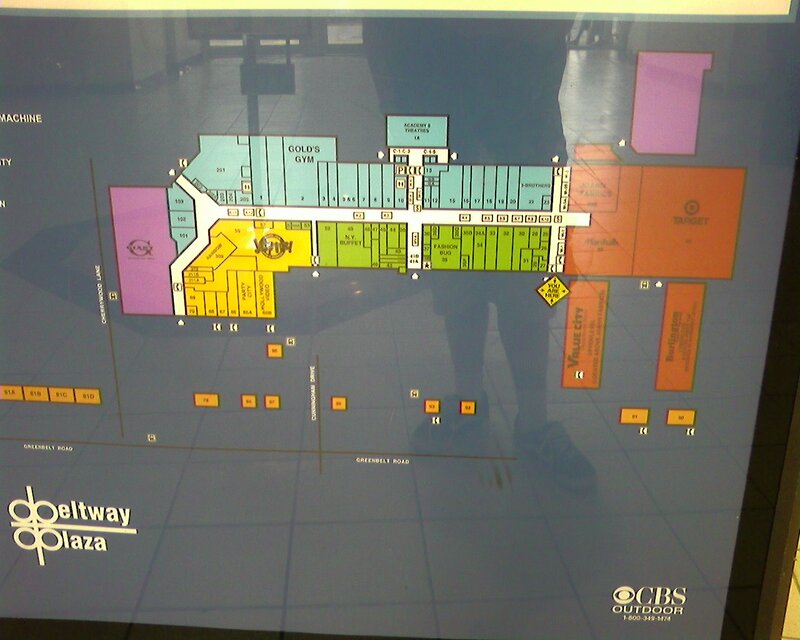 On the eastern end they have a Target, Marshals, Burlington Coat Factory on the basement lever, and up the escalators are the Big Lots and Shoppers World. While those stores and the Giant seem to be the only big names there, there seems to be enough small off brand shops to keep it afloat. There is stil a hardware store, the gym and the Acadamy theaters.They even have a books a million book store. Try finding a book store at a mall now a days. I live in Bowie now and for some reason Bowie does not have a lot of discount stores, so when I get the hankering to go shopping I make the 20 minute drive out there and hit the Big Lots. @Robin Burke, I agree. Love the Big Lots and the book store too! Loved reading these sites — grew up in Berwyn Heights; my mom worked at S. Kleins when it opened up, my grandmother was manager of the High’s. I was looking up Emerson’s — my office develops commercial and residential sites and we were bringing up old names of restaurants, etc. Loved this site and made the boring Friday afternoon go by a little faster. Take care all. @Debbie, I miss the High’s stores…best ice cream in the area! Some stores I recall from the 80’s…. lots more, I’m sure… it was a great place to “hang out” with all of our friends…. my father owned the place before it. called Nickelodeon. Ahhhh, good old Beltway Plaza. I recall taking the F-6 Greenbelt bus over and eating at the Chesapeake Bay Seafood House. My favorites were the old Continental Hobbycraft store and Bookland. I recall some oldies, such as an A&P store where the GIant is, a Big Boy on the parking lot, Equitable Trust bank on the lot, a BEST Catalog Store, Drug Fair, an old FOTO-MAT on the lot, Fantle’s Drugs, and True Value Hardware. Those were the days! I lived in Springhill Lake Apartments in the 60s and went to Springhill Lake Elementary from 3rd to 6th grade. The unstable hill that everyone refers to separated the apartment complex from the plaza. We’d walk up the steep hill on the apartment side and then down it to the plaza. The part of the hill closest to S. Klein (that we considered the backside of the hill) is where we used to go sledding on snow days, right into the back parking lot of S. Klein. When I lived there, Maryland experimented with busing and they bussed the kids from SHL apartments to Landover and vice versa. If you lived in SHL Apts then, you were bused according to the street you lived on. And yes, Greenbelt Junior High was up on a hill above the plaza. To date S. Klein, it had a full-on wig department. The mall originally had a soft pretzel kiosk in the center that also sold some sort of slushie drinks in either cherry or cola flavors. There was a gas station around the corner from the plaza. If you exited the plaza by the original drug store and swung right, the gas station was on the right. Used to pick up trash for a dollar to go to the mall. Area eats I’m surprised no has mentioned — Shakey’s Pizza Parlor and the original Ledo’s in Adelphi. Awesome. Just found this site while searching for something about THE ELECTRIC HEAD. My father had a shop called THE BUM STEER (later called NICKELODEON.) It sold turqiouse jewelry and clothes as far as I know. It had barber chairs in it and a traffic light. I was young so that was soooo cool for me. The first date I ever went on was in the movie theatre there. Rocky Horror Picture show played there for a long time. I also remember two pizza places one near the theater and one on a corner near BEST. Can’t remember the names. There was a video game dome in the parking area. There was a Beefsteak Charlies. Yes! How about famished fannies across the street and down a bit?? I grew up in Beltsville and we were at Beltway Plaza a lot. Now we hardly ever go because of the crime is so bad. Lets see….Bennigans is now a Joe’s Crab Shack…I remember the arcade in the mall and the one near Bob’s Big boys. Does anyone else remember Roy Rogers? It was a few stores down from Three Brothers. I also remember a F&M drugstore. F&M might have only lasted a few years, if that. I remember when Golds Gym came in, and its has closed within the last year. I also remember when they were trying to make the second floor into a like second floor mall thing, but the only thing I ever remember up there was some cheap toy store that didn’t last to long. Then Caldor came in. My parents used to do a lot of shopping at Best. I always thought that store was interesting because you would take a item number to a cashier they would ring you up and u would have to wait for them to bring it up from what looked like the basement. In the 90s or late 80s when the Giant moved across the street it was suppose to be one of the biggest ones in the area, don’t think it is anymore. That mall is the only mall I know about that had Santa Claus and Mrs. Claus. 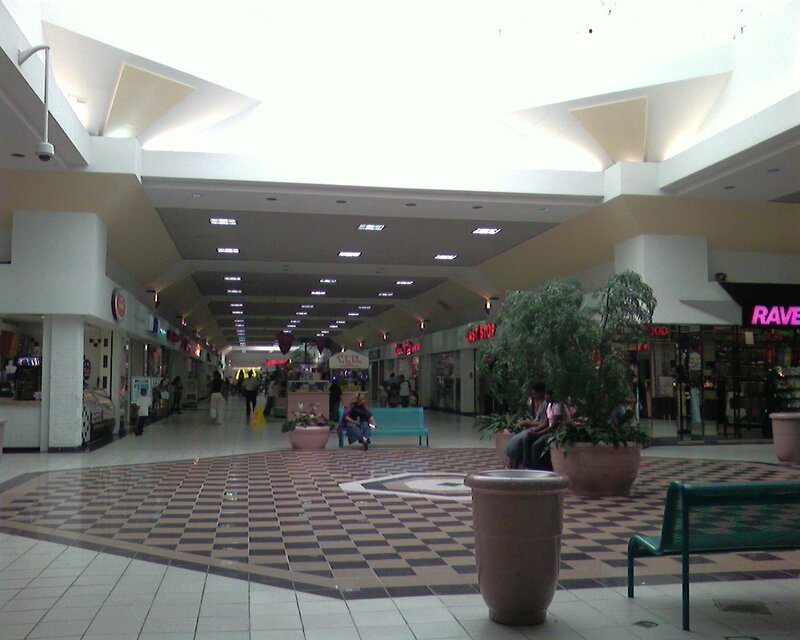 The Beltway Plaza mall is located in Greenbelt, Maryland. It was developed by Sidney J. Brown and First National Realty, opening on October 17, 1963. It was originally composed of a massive S. Klein department store separated by a large parking lot from an A&P Supermarket located in a strip shopping center along with a barbershop, single screen movie theater, and Drug Fair store. 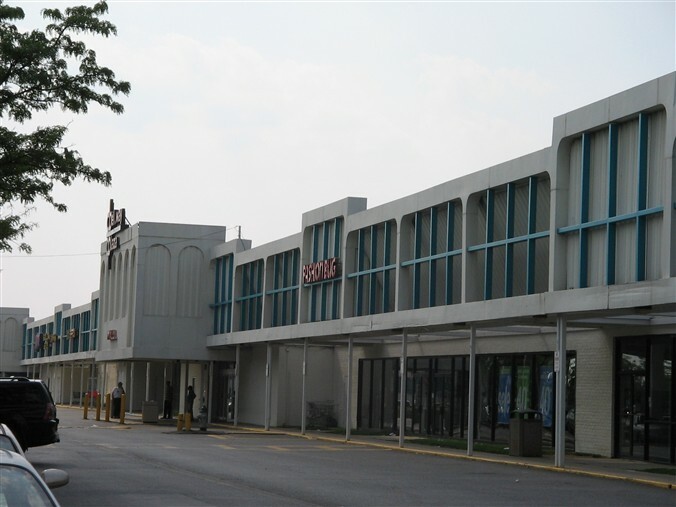 By 1972-73, a small indoor mall was created, situated between the strip shopping center and the S. Klein store, that included a 6-screen theater, steakhouse, a branch of George’s appliance store chain, an ice cream shop, and in-house catalog store. Within a few years of the S. Klein closing in 1975, the mall underwent major renovations. In the course of renovations, the space occupied by S. Klein was split up to create new spaces for different stores. Small fountains were added. The renovations included an additional 8 screen cinema and a Giant supermarket that was added to one wing of the former shopping strip. The renovation also enclosed the area from the original mall to the supermarket. The mall has 115 stores and restaurants and anchors include a Giant supermarket, Burlington Coat Factory, Marshalls, JoAnn Fabrics, Target, Shoppers World, and Big Lots. (Shoppers World and Big Lots replaced a space formerly occupied by Value City until 2010.) The Target cannot be reached from the mall without going outdoors, though it shares a common roof. On July 15, 1962, The Washington Post and Times Herald published a sketch of the 320,000-square-foot (30,000 m2) department store of the S. Klein chain, to be constructed in the Beltway Plaza Regional Shopping Center in Greenbelt, Maryland. At the time the two story and basement structure would be the largest Washington suburban department store and was expected to open the following Easter. Maryland Governor J. Millard Tawes witnessed the signing of the 30 year lease (the store would last only 13) between the plaza developer and S. Klein. S. Klein Department Stores, a New York retailer that was a pioneer in the discount business, is closing its two big Washington area stores within six weeks, industry sources said yesterday. Officers of the company, a subsidiary of McCrory Corp., refused to conform [sic] or deny the reports. Lisa, above, mentions how the upstairs portion, where there is currently (According the Beltway plaza’s directory on their website) a Big Lots and Shopper’s World, was once almost like a second floor to the mall, with small shops. The way I remember it, probably the clearest memory I have of the upstairs, before the Caldor, is the last time I went up there before it shut down. There was a bit of a food court area up there, I remember the tables and chairs. Not too many places to eat at, though. The store I remember clearest was, “Face Cards”. It was a trading cards store, that mostly focused on sports cards. That was up there. Later, during the remodel up there, in which it was all turned into a Caldor, I remember Face Cards reappearing later, at an end of the mall, which according to the directory I am looking at, was part of what is now a, “Dots” store. Face Cards was at least half of what Dots store currently occupies, according to the directory. Up until the late 90’s, Beltway Plaza was still an OK place to see a movie. You could always grab pizza, or before the movie stop by Giant’s Bulk Foods section, and get a cheap bag of candy there to go along with the popcorn at the movie. After the late 90’s, people I knew in that area left, and I wasn’t around, so I didn’t see much of the place for a while. I made another visit there in 2001 and maybe also 2002. I saw a couple movies with some people during those 2 years. The mall had changed a bit, the bulk foods section was gone at Giant, but I found the movie theatres to be about the same, which was a good thing. This was when Academy 6 was open, which was a nice theatre for what it was. The theatres weren’t huge, but it was quiet back there, a cozy area. I only saw the snack bar in the back open in the 90s, and even then it wasn’t open often. It sometimes seemed out of place, having to walk almost outside the theatre to get popcorn, etc. In 2005 I went there to see a movie with someone, for fun, since we hadn’t been there in ages. The theatre experience wasn’t quite the same. We saw the movie at the Academy 8, this appears to be not long before AMC sold it. Cell phones had become much more common than they were in the late 90s, early 00s. I recall at the start of the movie, a man accepting his phonecall, after it rang, and having a conversation in a theatre about 2/3-3/4 full. The guy talked for about 2 min, people got more and more agitated, asking him to leave the theatre, stop talking, and eventually at least one person screaming, “SHUT THE F*** UP!!!!!!!”. I almost thought a fight was going to start in there. Speaking of which, I recall what someone else mentioned in a post here, about the stabbing at the Academy 8. That was in 1998, I went to the mall the day after, and saw the police tape near the sub-station near the Academy 8, and I think also the photo booth thing. I also saw a lot of police around the mall, and wondered what happened. Then I heard/read on the news the night before a guy was robbed of his Eddie Bauer coat. From what I recall, the thief wrapped his arm around the guy in front of him, after the movie Half Baked, and stabbed the guy a bunch of times in the chest, then pulled the coat off of him, and ran out of the theatre. Sometime later, someone told me the a Gold’s gym was being built where the AMC 6 was, maybe in 2004 I heard this. In 2006 or so, I saw AMC 8 sold their 8 screen theatre there to an independent place. I haven’t been at that mall since 2006 or 2007, when I took a peek there during the day, to see what stores were there, and what had changed. 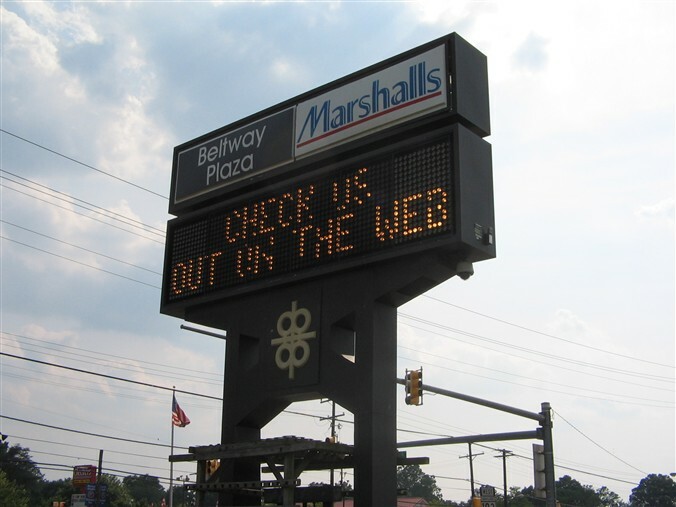 Looking at the directory, while making this post, it reads that on the 18th of May, 9 days from now, a TJ Maxx will be opening at Beltway Plaza. So, that’s new. It’s not anyplace I’d go to anymore, but I have some memories of decent times there at the theatres, good deals at Best’s and Caldor’s closing, Video Village, Golden Dome, etc.. Most of my memories of this mall, are from 1990 until 1999. Most of my visits to Beltway Plaza, mostly during the 90’s, were to go to the movie theatres there. AMC took decent care of the movie theatres there. Up until the late 90’s, I thought Beltway Plaza was still an OK place to see a movie. You could always grab pizza, or before the movie stop by Giant’s Bulk Foods section, and get a cheap bag of candy there to go along with the popcorn at the movie. There were also 2 small arcades in the mall, so one could always go there before a movie, after a movie, etc. The Golden Dome outside was OK sometimes, but during the late 90’s it turned into a Funcoland video game exchange place, which was still an OK place to look for deals, kill some time, etc. I recall what someone else mentioned in a post here, about the stabbing at the AMC Academy 8. That was in January 1998, I went to the mall the day after that happened to see a movie at the AMC Academy 8 there. I saw the police tape next to the sub-station near the Academy 8, and I think also the self-service photo booth. I saw a lot of police around the mall, and it left me wondering what happened. Then I heard/read on the news the night before a guy was robbed of his Eddie Bauer coat. From what I recall, As the credits were rolling for the movie Half Baked, the thief wrapped his arm around the guy in front of him, stabbing the guy a bunch of times in the chest, then the theif/murderer pulled the coat off of the guy, and ran out of the theatre through the exit that led outdoors. I recall reading months later that the murderer was caught. After the late 90’s, people I knew in that area left, and I wasn’t around, so I didn’t see much of the mall for a long time. I made another visit there in 2001 and maybe also 2002. I saw a couple movies with some people during those 2 years. The mall had changed a bit, the bulk foods section was gone at Giant, but I found the movie theatres to be about the same, which was a good thing. This was when Academy 6 was still open, which was a nice theatre for what it was. The theatres weren’t huge, but it was quiet back there, a cozy area. I only saw the snack bar in the back open in the 90s, and even then it wasn’t open often. It sometimes seemed out of place, having to buy your popcorn and other concessions outside the theatres, near the box office, and if wanting refills having to walk out there. See, there were two snack bars at the AMC 6. One near the box office, in the mall area, and the other in the back near the theatres, which only operated sometimes. 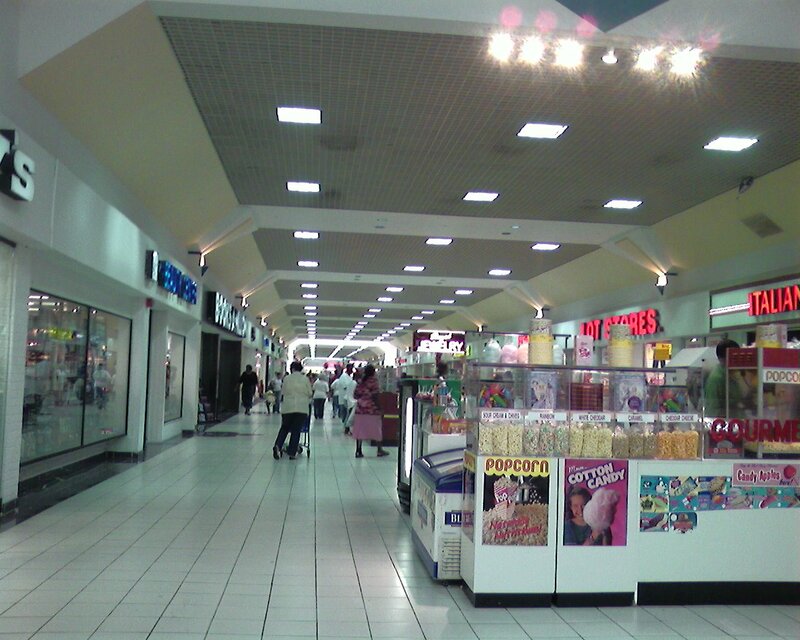 In 2005 I went to the mall to see a movie with someone, for fun, since we hadn’t been there in ages. The theatre experience wasn’t quite the same. We saw the movie at the Academy 8, this appears to be not long before AMC sold it. Cell phones had become much more common than they were in the late 90s, early 00s. I recall at the start of the movie, a man accepting his phonecall, after it rang, and having a conversation in a theatre about 2/3-3/4 full. The guy talked for about 2 min, people got more and more agitated, asking him to leave the theatre, stop talking, and eventually at least one person screaming, “SHUT THE ____ UP!!!!!!!”. The perosn on the phone just kept having his conversation, laughing at the multiple people in the theatre telling him to be quiet. It was getting to the point, where I thought someone was going to take his phone from him, since some people seemed to be getting out of their seats due to this noise. 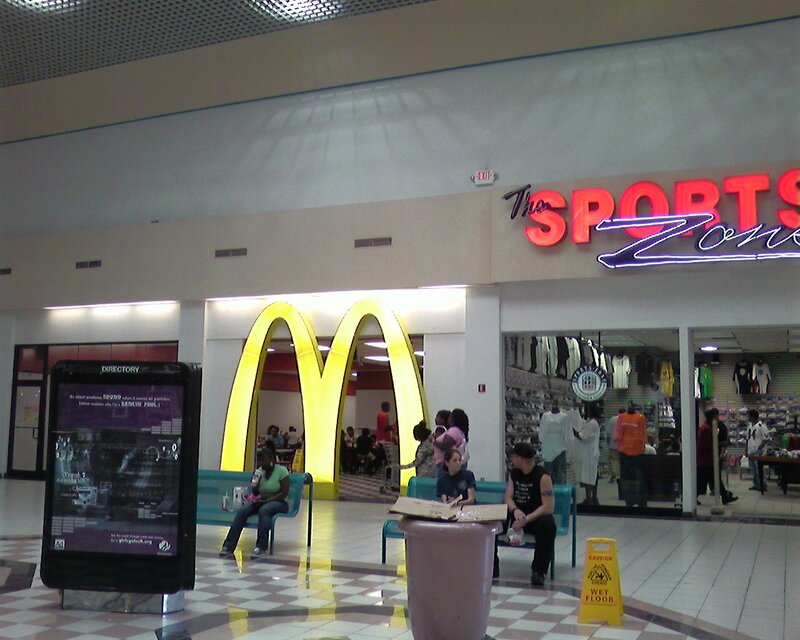 I remember in 2004 someone told me the a Gold’s gym was being built where the AMC 6 was. It was sad to hear that movie theatre was going to be gone for good. In 2006, on a visit to the mall to see how things had changed, I noticed that AMC 8 sold their 8 screen theatre there to an independent place. I haven’t been at that mall since 2006 or 2007, when I took a peek inside there during the day, just to see what stores were there, and what had changed since my last visit. I been to the mall since that visit. Looking at the Mall’s directory, while making this post, it reads that on the 18th of May, a TJ Maxx opened at Beltway Plaza. So, that’s new. It’s not anyplace I’d go to anymore, too much has changed, but I still have some memories of decent times there at the movie theatres, great deals at Best’s and Caldor’s “Out of Business” closings, Video Village, Golden Dome and the other arcades, etc.. I remember both S. Klein’s, the one in Greenbelt and the one in Alexandria. The one in Alexandria had a full-sized restaurant with long curtains and chandeliers, in addition to a snack bar at the entrance that sold Italian Ices. You could find anything at Klein’s—records, school supplies, cocktail dresses, tools, even pets! As the neighborhoods in both areas decayed, the two S. Klein’s stores became prey to shoplifting. I’ve heard from one past employee that shoplifting hurt the company significantly. By the early 70s, the restaurant was looking shabbier and shabbier. They were huge stores, I remember, and there was much sadness when they closed. Neither shopping area has ever really recovered. The same thing happened in Langley Park after the demise of Lansburgh’s (especially painful to see what’s happened to that shopping center!). I do remember the Beltway Plaza Mall post-Klein’s. It felt desolate. However, if I remember correctly, it did have a bookstore for a while. I also recall the Hot Shoppes with its “air-phone” curb service. That was sort of in front of Klein’s—we went there in the 60s and it was fun to be allowed to call the waitress by pressing the air-phone button. I remember it too. That alien was a lot cooler looking than the great Kazoo. A picture of it would be awesome! Probably would need to do some serious historical research though. I went into the electric head one on high school. The asked is how old we were and told us we had to leave. The Schwinn shop, was where I got my first ‘real’ bike too. A green ten speed Schwinn Varsity. Both the Electro Had and Schwinn were very close to Famished Fannies sub shop. I agree with so many others that I would hate to see it torn down. Three years ago I moved back to this area (grew up in College Park/Adelphi/Seabrook area) I fondly remember S Klein on the Square as a place I used to buy my record albums back in high school. I do admit that parking can be challenging but recently discovered the upper level parking lot that is virtually empty. If you don’t mind walking a bit, that’s a great place to park! The mall houses one of my favorite shoe stores, Shoe Show, and some other fun little stores, though sadly some of my favorites have gone out of business and closed down in the past year. Love the little hardware store there too. There are some gems of little stores that you won’t find any place else. Let’s hope they stay!